For motivation for healthy eating habits, you should look at yourself. There are so many people in the world who suffer from obesity and it can get harder in life for those who are morbid obese. You will that your weight will hold you back from a lot of experiences, and your eating habits will prohibit you from being healthy. So many things could motivate a person to start eating right, but there are many things that hold a person back from doing things that are healthy. The first reason that people find it hard to be motivated to eat healthy is the price of food. 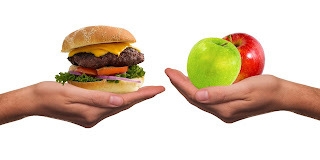 The thing is that healthy foods do cost more, but if you learn how to cut out all the sweets and the junk food, then you will actually be saving money. You may think that you are getting more for your dollar, but you really aren’t. To find the motivation to spend the money on healthy food is to find self-control. If you are grazer then you obviously will notice a difference in the amount of food that you have. However, if you can find it in you to begin a new way of life then you will surely have the money for your altering eating habit. The number one reason that you should find motivation for healthy eating is yourself and family. First, you should care about yourself. You should care about the way that you look and feel. When you eat junk food, even though it may taste good, you will find that it can depress you. You will also notice depression when you finally take the time to look at yourself. When you don’t like how you look you’ll become depressed and begin to hate yourself, however, if you take the steps now to eat healthy you will never have to worry about feeling bad about yourself. As for the family, you should eat healthy for them. First, you need to set the example and show your family, mostly your kids, the right way to tackle life. Secondly, you should being to eat healthy for the fact that foods can be deadly. After long term eating of unhealthy foods, your heart begins to weaken. You may be putting yourself and your family in danger because of things like strokes, heart attacks, and high blood pressure. You will find that your health is not just a concern of your own, but your family cares too. You should increase the habit of eating healthy foods for all the things that you might miss because of all the junk food. Again, it does cause depression, but it also keeps you from doing some of the things that a normal person takes for granted. There are so many things that you are going to miss because you did not take care of yourself. You will find yourself tired all the time and your moods will change drastically because you are not eating right. There are so many things that you will miss because of the bad foods that you eat and you really should think about the future. If you need motivation for your health, the future is just the place. Can you imagine what could happen to you in the future if you do not take care of yourself? You may end up seriously hurting yourself and others because of your lack of concern for health. In fact, in the future, you may end up dying because you did not eat the right foods when you had the choice. Remember, eating healthy is a choice that we all should make, no matter what.